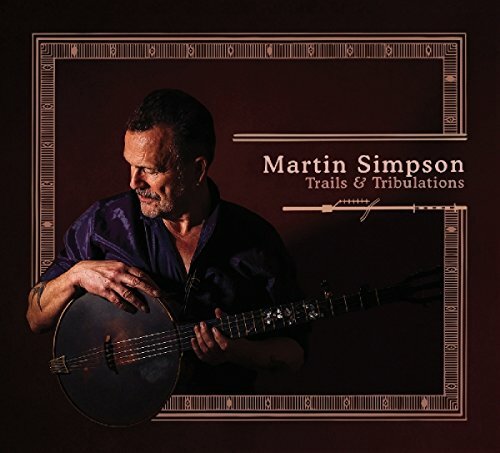 Martin Simpson, a master of acoustic blues, releases his 20th solo album in 40 years. ‘Trails & Tribulations’ arrives in the wake of a triumphant headline set at the Cambridge Folk Festival and in heated anticipation of his appearance at London’s Kings Place in support of the album launch. The album follows ‘Vagrant Stanzas’ which was warmly received by critics in 2013 and the collaborative ‘Murmurs’ from 2015 which saw Simpson join forces with Andy Cutting and Nancy Kerr to dramatic effect - performances noted for their sense of “majestic, intuitive and joyful playing”. As on ‘Murmurs’, ‘Trails and Tribulations’ is a carefully selected mixture of poems, traditional and contemporary songs. Simpson states “[it] is a collection of songs about nature, about travels and about real life stories”. His own material has been composed because, as Simpson says himself, there were songs “I had to write because nobody else knew what I wanted to say.” The mentality which underpins the material on the album is one of appreciating the wonder of what is immediately in front us and taking the time to take stock of the natural magic we may easily miss or take for granted in our busy modern lives. Simpson says “I look at the world as I pass by, on the road, out of the train window, or as I stop and pay close attention to the square foot under my nose. There is so much to see and to hear and to inspire and to try and understand.” The recordings on ‘Trails and Tribulations’ share this intention throughout, feeling truly earthy, alive and reflective. A real call to getting back to and celebrating the simple things in life. The collection opens with Simpson’s reading of ‘Blues Run the Game’, a traditional song originally written and performed by Jackson C. Frank. A composition steeped in folk history, with many industry luminaries having recorded their own interpretations including Simon and Garfunkel, Sandy Denny, Nick Drake and later Bert Jansch. Simpson’s recording is a nod of respect to his contemporaries. However, while often heard stripped back and fairly sparse (see the recent bonus track on the reissue of John Renbourn’s eponymous album), Simpson hits a middle ground - a warm and full sound but with plenty of space for the song to breathe. Supported with beautiful harmonies and the most delicate of instrumentation, with the production and engineering by Andy Bell immediately apparent. A touching and embracing rendition, like a welcome tumbler of warming whisky on a chilled early winter night. ‘Bones and Feathers’ launches with the sort of picking which evokes the dueling banjos from the movie “Deliverance” The rhythm and bass create the feeling of water lapping at a river's bank as the seasons slowly change. “I walk on through the back streets, as the night turns into morning...” gives the sense of the restless search of our protagonist. The song is almost hymn like in its composition with close harmonies creating a fable-like atmosphere, as if verging on a modern psalm. There follows one of the standout tracks, ‘Thomas Drew’. Opening with a beautiful lullaby of fingerpicking, this is in contrast to the story which lies within. The tale is told by the ghost of a man who was shot down in a disagreement over a craps game. The story follows the spiritual pardoning and execution of John Hardy, the murderer. Despite the content of the story it is a haunting, beguiling and bewitching track with breathtaking harmonies and which will warrant many repeat plays. ‘East Kentucky’ has a hypnotic complex riff and foot tapping bassline. This rhythm builds with accompanying fiddles and maracas which conjures images of a band in a bar who are really getting the punters dancing and up on their feet. This is a track which will also be a scorching live favourite. This track is followed by the first of two interludes on the album, which both serve to add to the live atmosphere. ‘A Ballad for Katherine of Aragon’ would not sound out of place on the soundtrack to “Inside Llewyn Davis” and is evocative poetic tale. This is followed by ‘Maps’ which has elements of the storytelling found on the the Small Faces “Ogdens' Nut Gone Flake”, with exquisite fingerwork throughout. The introduction to St. James Hospital is a true example of Simpson’s lifelong ambition to blend influences of Celtic, folk and african-american musical styles together. The vocal is a stirring and powerful lament, which stays with you long after the last note, not least for Simpson’s astonishing playing. Ridgeway, another standout track, features the emotional accompaniment of Andy Cutting on diatonic accordion. A poetic ode to the Ridgeway track, embracing the rhythms and wonder of the natural world “The sun warms my bones and the lazy air rises, lifts red kites and buzzard in effortless spirals…” which is both respected and challenged in equal measure by the storyteller. The album closes, as it opened, with a “classic”. ‘Reynardine’ is a traditional old English ballad which tells of a werefox who attracts beautiful women to him so that he can take them away to his castle. It is introduced with a second interlude which showcases Simpson’s awe-inspiring playing. The track is intoxicating in its folk tradition but with a contemporary edge. It provides a fitting conclusion to an album which champions both the old and the new and treasures each.